Monday, Sept. 15 – Cellular and DNA coding: 60:8:24 Lunar Moon of Challenge – AHAU, Yellow Galactic Sun, Tone 8 Radial Plasma Gamma (Mental level). Kerri Guillaume picked me up along with the suitcases at Jeff’s place and we went by car to meet up with Wanda Garstad, Calgary ref. bearspiritmedicine@yahoo.com a becoming wholesaler of Crystals for and to Bushman’s Bin, Caroline, Alberta djasperfay@gmail.com or https://www.facebook.com/bushmans.bin.5 during the day. Monique and another Sister (sorry forgot your name) were present. The owner Darell is a mineowner, digger and wholesaler of Crystals from all over the World. Please take a look at facebook or send him an email to connect with him. He has an amazing collection of Crystals and stones. One by one the trays came out of the trailer and were presented and calling. Starting with the Lemurian Seed Crystals, where one called to be resonated with for quite awhile. Tray after tray were placed on the tables outside in the Sunlight as we all opened our Hearts and went into the grace of the collective Crystalline offerings and gifts as One and the Same. Being called to connect and go into the flow. A tray appeared of the Nirvada Crystals. The Lemurian Seed Crystal went back into the tray whilst the Nirvada Crystal came into the Heart Blessings to resonate and communicate. 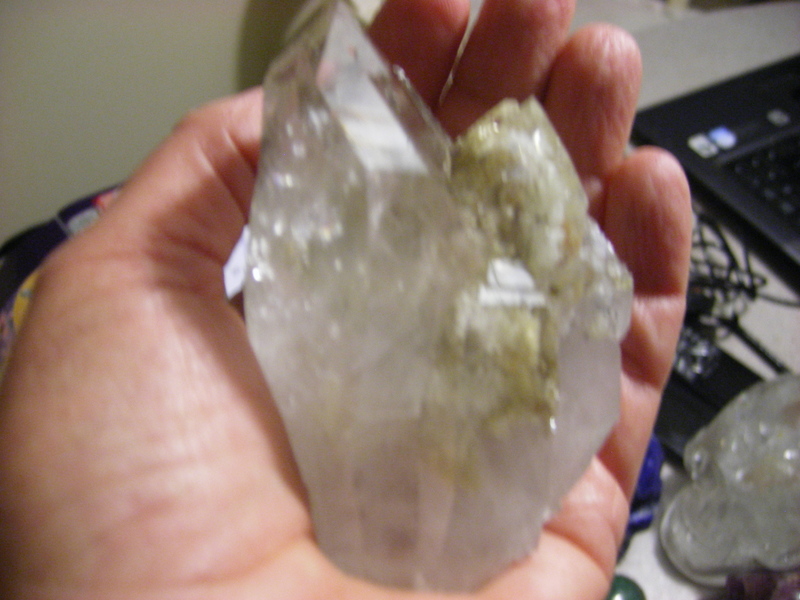 The next elegance came via the Self Healing Crystal Quarts.The Joy of such a Honored Respect completely move the Inner frequencies. Amazing sharing occurred and a treasure calling opened the portal way of interacting Self Healed resonance. 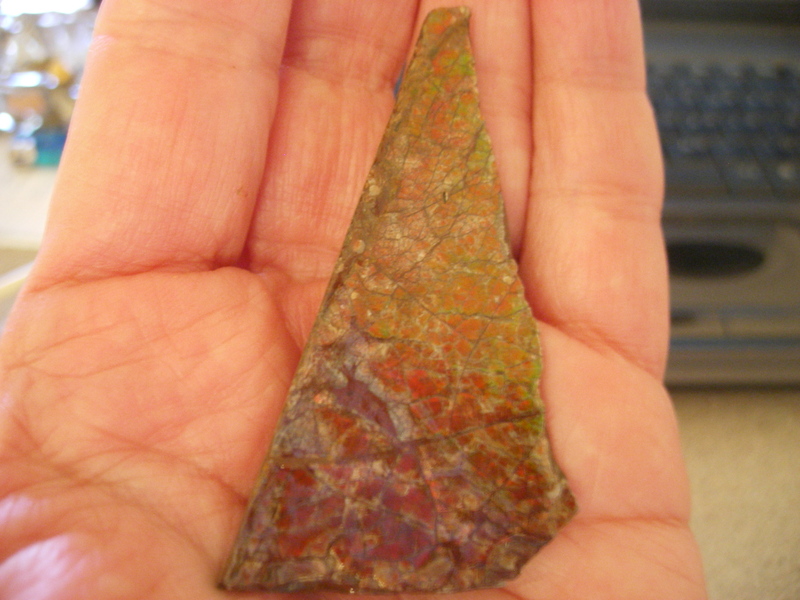 Whilst paying for the two crystals Darell offered me a Hanger and loose Ammolite crystals to sell in Europe. If interested please communicate via CHarren@kpnplanet.nl for more information. See also http://en.wikipedia.org/wiki/Ammolite for more information or http://www.ebay.com/gds/What-is-Ammolite-Gemstone-Where-It-Found-/10000000019754916/g.html or http://www.universallifetools.com/2012/02/crystal-healing-ammolite/. 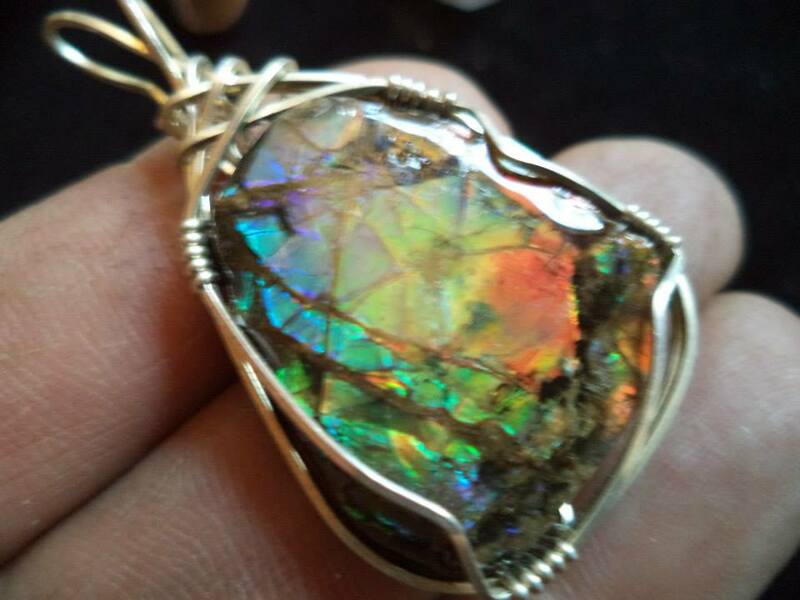 All of the properties of Ammonite, plus: Ammolite helps to awaken your awareness of evolutionary shifts in consciousness – in yourself and in the world in general. Deepest Gratitude and appreciation Bushman’s Bin for your heart sharing’s, wisdom and Love Presence. We than left and the three of us (Kerri, Wanda and me) plus the other Sister went by car for a lunch break at a Tavern. Wonderful to have such a Heart vibration flowing. Thank you All Sisters. Kerri and I than went onwards to Cochrane to meet up with Kimberley Buckler were I will be sharing and staying with, in her gracious home and garden until Friday, September 19. We had dinner together and had a heart conversation back and forth. The Crystals called to be in a Grid or wheel on her table. Kimberley offered to give me a healing session that evening. What a crystal journey was experienced and releasing as well. Thank you dearly Kimberley Buckler http://www.spirit-soul-healing.com/ or https://www.facebook.com/jenning1. She shares Reiki initiations and Crystal Workshops in Cochrane. Tuesday, Sept. 16 – Cellular and DNA coding: 61:9:25 Lunar Moon of Challenge – IMIX, Red Solar Dragon, Tone 9 Radial Plasma Kali (Spiritual Level). In the morning Kimberley and I went for a drive and walk around the area to a Riverside having a picnic and connecting with the Sacred Energies there. In the evening we went to a Tavern/Bar to listen to some live music unfortunately this will start in October. It was a great walk and experience to share this together. Wednesday, Sept. 17 – Cellular and DNA coding: 62:10:26 Lunar Moon of Challenge – IK, White Planetary Wind, Tone 10 Radial Plasma Alpha (Physical Level). We went to a park to have a picnic together and visited a friend of Kimberley at his home whilst she was giving him a healing session. We than had a short snack and then went to the TV studio of Swamp. There was the weekly TV presentation that Kimberley was co hosting see further http://www.youtube.com/watch?v=Htg3jtjsQLI&feature=youtu.be. We than went back to Cochrane to have a pleasant deep sleep. Thursday, Sept. 18 – Cellular and DNA coding: 63:11:27 Lunar Moon of Challenge – AKBAL, Blue Spectral Night, Tone 11 Radial Plasma Limi (Emotional Level). Today Kimberley and I stayed around the house in the beginning of the day. Kimberley’s granddaughter was over for a visit. A gracious girl with many qualities. We worked together in the garden taking out the beets for preserving including the leaves. It was a wonderful warm day today. We than went out for a walk along the Elbow River in Cochrane and did some grocery shopping together and the granddaughter and grandmother had their conversations and sharing during the day. Later on in the day we headed out to Buckler’s farm http://www.bucklerfarm.ca/ so that the granddaughter and grandmother could communicate with the horses there. Onwards we went to the granddaughter’s home and met the family. The granddaughter was a little bit reluctant to come home seeing that there were some problems at school and in the neighborhood. All went reasonably well. In the evening I shared a intuitive Tzolkin journey with Kimberley via her Galactic Signature or Landing spot together with the 13 tones and the Higher Self wave with 26 crystals or Crystal Skulls. Kimberley co created a Crystal Grid with this. Deepest Gratitude and appreciation for the Inner Guidance, Light Beings who shared this One and the Same Open Space. Friday, Sept. 19 – Cellular and DNA coding: 64:12:28 Last day of the Lunar Moon of Challenge – KAN, Yellow Crystal Seed, Tone 12 Radial Plasma Silio Galactic Activation Portal (Mental Level). Kimberley offered to drive me to Laurie and Jeff’s place at Many Horses Circles, Redwood Meadows, Calgary to share and sleep over there for the weekend and share a gathering with all in the evening. Kimberley asked me where would I like to go. Seeing I do not know the area I requested we go in southern direction as we have covered the East, North and West together already. We went to a quaint little town to visit a Spiritual shop that Kimberley had heard of and wanted to share this with me. Indeed it was a pleasurable afternoon sharing. Such a delightful artistic shops. I invited Kimberley out for lunch in a Baptist Church that was renovated into a restaurant. Great company and good food was shared. As we were walking back to the car Kimberley met two ladies that she knew. They shared their stories together. It was good to hear that the ladies shared Healing Sound Concerts with many using Singing Bowls etc. We were a bit early arriving at Laurie and Jeff’s place. Lance Aubrey met us outside and we were called to take a walk to the Elbow river together on Ancient Indian Grounds. Whilst walking I could see and feel the Sacred Presence of various Ancient Ones. Once at the river I placed my bare feet into the waters here to ground, anchor, purify and cleanse before sharing the gathering this evening. 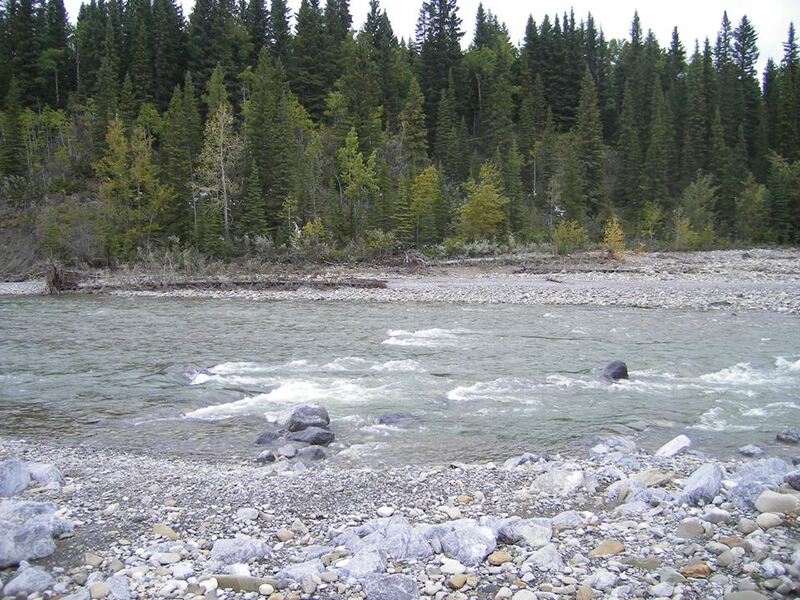 I was also called to co create a grid with the Sacred Stones here and send the blessings to All that Is via sprinkling the grid with the Sacred Water of Elbow River. Toning an Ancient Chant that was passed through. Upon our return from the walk – Laurie and Jeff welcomed us into the house and other beautiful soul brothers and sisters came in to join and gather for this evening. We shared a meal together and had a drink. Laurie and Jeff had cleansed and upgraded the living room together with huge crystal clusters, Crystal Skulls and a Sacred Altar. The Crystals and Crystal Skulls also called to co create in this open space as well that were journeying with me. Jeff handed over the Himalayan Crystal Skull “Apollo 7”to each brother and sister that gathered in the room this evening. He handed over the Ancient Himalayan Crystal Skull “Golden Sister of the Moon” to me to connect and go into silence for further messages. Via the message it was requested that Jeff would introduce and start the gathering for the evening. Jeff took us All into the expansion of the Heart Open Space etc. From here “Golden Sister of the Moon” and me as the channel messenger continued the journey onwards via the stars, galaxies etc. After this the toning sound came through to uplift every Soul’s level. Along with this a request was made to share each Personal Soul Sound with All That Is. Various brothers and sisters shared their story telling or sound. The circle than spinned in movement for the Highest Good of All. Golden Sister of the Moon requested to be placed in the hands of everyone. Some deep heart sharing were brought forth via everyone that was physically present. Such Heartfelt pulsation resonance were related. At the end Golden Sister of the Moon requested to be placed in Lance’s hands so that he could resonate with the guitar strings the closing message for All. A tender subtle embracing sound resonated touching each of our heart strings. After this it was a celebration party time. Various music instruments were shared via Jeff such as the djembe, rattle and shaman drum resonating the Joyous Bliss. Dancing, laughing together as One and the Same. At the closing of the evening we all gave a group hug to Kimberley seeing that we would be attending her Uncle’s funeral tomorrow and later in the week another Uncle’s funeral as well. We all than shared snacks and drinks together as well. We went outdoors to connect with the clearly starry night. Laurie and Jeff offered their hot tub on the porch to share our stories and feelings in the Now Presence together. The evening went into a flow until the early hours of the morning. Thank you All in appreciation for this openness of growth and development.